I got my first clear skies in almost a month today, so I had to take advantage of this rare chance and set up my 10" Zhumell in the backyard. I hadn't expected the skies to clear, so I didn't really have a plan in mind. So I decided to just wing it as I went, and use Sky & Telescope's Pocket Sky Atlas to help me out in picking some good targets. This is the first clear sky I've had this season without a moon, so I decided that deep sky objects would be my targets this night. Me with my 10" Zhumell. M57 - The Ring Nebula in Lyra: This was actually the first time I had found the Ring Nebula. For some reason, I had just never looked for it. I saw Lyra was still positioned well, so I pointed the scope towards Lyra and found the Ring Nebula after a short search. The nebula was a definite ring shape. It kind of reminded me of a gray Cheerio, actually! 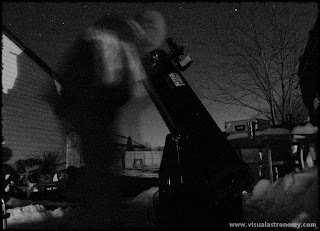 M1 - The Crab Nebula: Taurus was starting to become visible over the garage roof, so I swung the scope over to M1. While I've never seen any detail in M1, I've always noticed that it seems to really pop out of the eyepiece at you. Tonight, it almost seemed to have a 3-D effect, and floated above the black background. M36/M37/M38 in Auriga: Some of my favorite open clusters are in Auriga. The three clusters are in a mostly straight line, which makes finding them rather easy. I started with M37, which is in my opinion, the best cluster of the three. M37 is a nice, dense cluster, so the other two clusters just didn't seem as impressive after M37. M45 - The Pleiades: M45 is one of my favorite deep sky objects, and it never disappoints under moonless skies. In my 10" dob, I can just barely start to see the nebulosity surrounding the open cluster. I can tell it's not just dew on the eyepiece because the patterns in the patchy nebulosity follow the stars movement in the eyepiece. One of the reasons I like M45 so much is the color. Its component stars show up as a pale-bluish and cold white color. The Double Cluster in Perseus: This is by far my favorite open cluster(s). At a magnification of 39x in my Z10, it completely fills the FOV with bright stars. The dense cluster, combined with the backdrop of the Milky Way, always makes for an impressive sight! M42 - The Orion Nebula: It's been a while since I've seen the Orion Nebula on a moonless night. My reaction is always the same to M42: "Whoa..." M42 is the reason I'm an astronomer. The amount of detail visible in this nebula with the Z10 is just astounding, I could look at this nebula for hours and not get tired of it. While the seeing wasn't good enought to really check out the trapezium, the wide-field view of the whole nebula was simply amazing! Overall, I'd say it was a productive night! I found one new object and many familiar favorites that I haven't seen in a year! Hopefully the clear skies last long enought to see the Moon-Jupiter-Venus conjunction on Monday night! This may be a terrific beautiful report. My organization is practically proud of an individual's superior job. Everyone insert extremely invaluable material. These days check this check cashing Hoping to browsing future place.